WSL parent Dee Bireddy tells 4th graders the story of Lord Rama and the festival of Diwali. Known as the “Lantern Song” in Waldorf schools, this song has been resonating through our house the past couple of weeks, signaling the journey towards the winter solstice. Throughout the school year, we come together to celebrate festivals that mark the passage of the seasons, which in turn establishes a natural rhythm for the children. Though many of the common Waldorf festivals are rooted in European tradition, at WSL we also celebrate festivals that reflect the cultural and religious traditions of our student body, both in individual classes (often incorporated into the world history curriculum) and within the school at large. 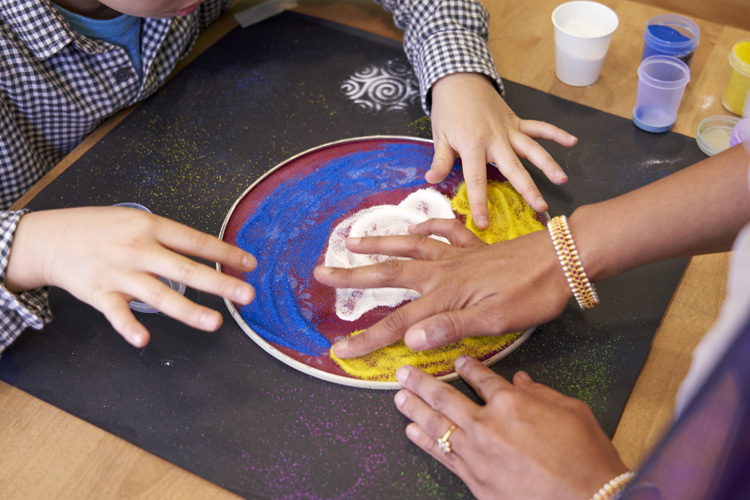 Through these experiences, students develop an understanding of and respect for the diverse cultures of the world and celebrate what’s common to us all, our humanity. Being of Indian origin, this time near the solstice holds a special place for us as it brings in a very special festival called Diwali, or Deepavali—a five-day festival of lights. Diwali symbolizes the victory of light over darkness, knowledge over ignorance, good over evil. Various legends point to the origin of Diwali. According to one, Diwali commemorates the return of Lord Rama (along with Sita and Lakshmana) from his 14-year exile and vanquishing the demon-king Ravana. He was welcomed by the lighting of numerous lamps, and the day came to be celebrated as Diwali. In spite of the many challenges thrown at him, Rama kept his humanity intact and was fully engaged and lived a life without regrets, and for this he is revered throughout the world. Traditionally, the festival is celebrated in India with thousands of diyas (earthern lamps), colored lights, and lanterns being lit, turning each village and town into a fairyland. Celebrations also include fireworks at night and Rangoli designs drawn by hand on pavement near home entrances with colored rice flour. On Wednesday, Grade 4 students listened attentively as my husband narrated this story of Ramayana, after which the students created beautiful Rangoli artwork. The next day, parents and students were treated to a beautiful, moving play by Grade 5 students that brought this story of Rama’s victory to life. The play is part of the 5th grade study of world history, encompassing the ancient civilizations of India, Persia, Egypt and Greece. 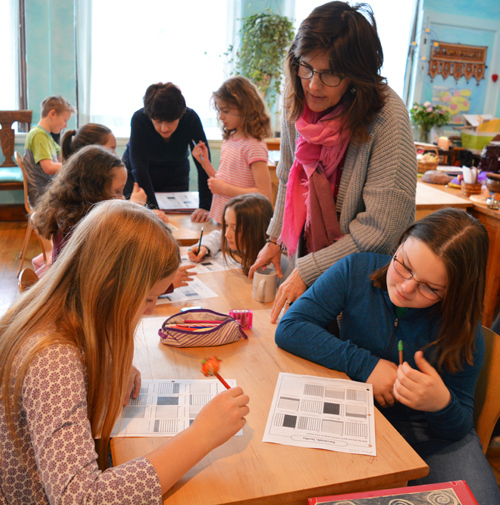 Through the study of these civilizations, children at WSL discover the connection between ancient origins and the modern world they live in. Dressed in lovely traditional Indian clothes, WSL parents Claris Chuah and Shilvaik Bakshi, Yoshiko Mizukami and Harry Reddy, and Tara and Samarjit Shankar gave a brief history and meaning of Diwali, followed by lighting clay lamps in respect for Goddess Lakshmi. We also joined in singing beautiful Indian kirtans (hymns), followed by Aarti and Tilak. As is the custom, delicious Indian food and sweets were shared among the Grade 5 families. As I reflect upon the Lantern Walk, which is celebrated around the same time as Diwali, I realize that there are many similarities between these festivals. They both celebrate the inner light in the outer darkness of the approaching winter. My husband and I feel fortunate to be at the Waldorf School of Lexington, where learning is infused with human values, diversity is celebrated, and community is forged through meaningful shared experiences. The festival of Michaelmas, which is rooted in harvest traditions from the Middle Ages, falls just after the autumnal equinox, as northern climates head into the dark, cold winter months. Michael is an archangel in Christianity, Judaism, and Islam, but the festival can be observed by people of all faiths and spiritual traditions, as well as by those simply seeking fortitude in overcoming challenges large and small. Under a cloud-lit sky, a WSL 7th grader triumphs, having subdued the dragon of darkness with her sword of light. During the festival, joy and exuberance can be seen on the children’s faces, which is a hallmark of Waldorf education. Throughout the school year, teachers incorporate many special events, such as Michaelmas, that reach children in mind, body, and spirit. The result is engagement in the curriculum, an intrinsic enjoyment of school and learning, and a spirited school community with friendships across the grades. The festival begins on the school’s athletic field with an all-school pageant. Each class performs a portion of a play, where St. Michael confronts the dragon. The play ends with the symbolic slaying of the dragon, which calls on us to overcome the dragons of our age—egotism, untruth, fear, and hatred. The image of Michael battling dark forces with his sword of light gives children courage and helps them have faith in their own resolve for difficult tasks ahead. Not by coincidence, this festival often falls close to the Jewish High Holidays and the Islamic Holy Month of Ramadan, both occasions for self-purification. After the pageant, children process to a larger field in Lexington for a dragon-themed game, carrying festive colored banners and singing songs of St. Michael. The Waldorf School of Lexington’s campus abuts the Minuteman Rail Trail, connecting the school to Arlington’s Great Meadows as well as green space in our home town of Lexington. During the games, each class in grades 1 to 6 represents a village that has had its jewels stolen by dragons, played by 8th graders. Villagers must dash across the field to reclaim their jewels while avoiding the dragons. They are aided in their journey by angels (also 8th graders) and protective trees (7th graders). Thank you to all the parents and teachers who sewed and felted such amazing Michaelmas banners, and to the creative efforts of many hands in recreating the dragon body this year! It was another wonderful festival. Dr. Anthony Rao is a pediatric psychologist and an expert on the development of boys. 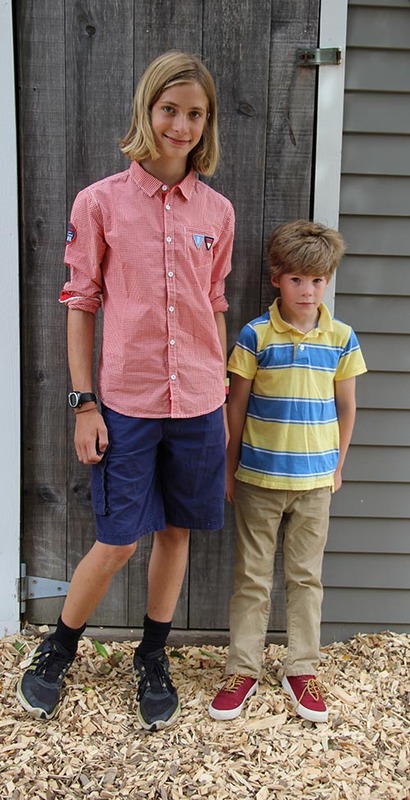 His book, The Way of Boys: Promoting the Social and Emotional Development of Young Boys, is an insightful primer for parents on how to handle the unique—and at times exasperating—challenges of raising sons. A blend of scientific information and practical advice, the book highlights the many ways that today’s society often puts a range of normal boy behaviors in the problem category. You can download an expanded version of this blog post here. Time outdoors exploring the natural world is a healthy beginning for both boys and girls—and something that is increasingly hard to find as even preschool programs become academically oriented. For example, how many parents know that girls seem to be wired from birth to look at faces far more often than boys? This neurological difference translates to behavioral differences that can get boys in trouble once they reach preschool, where making eye contact is expected and becomes a litmus test for normal social development. Along with differences in genetics and socialization, boys must also contend with the demands and biases of today’s fast-paced, highly competitive, digitally overloaded world—forces which often work against boys’ learning styles and natural development. Dr. Rao will explore these themes and more in his talk, "Raising Boys to Be Their Best in a Rapidly Changing World," at the Waldorf School of Lexington next Tuesday, March 20. Details here. Dr. Rao holds a Ph.D. in psychology from Vanderbilt University. For more than 20 years, Dr. Rao worked in the Department of Psychiatry at Children’s Hospital, Boston, and served as an Instructor at Harvard Medical School. He currently consults with families all over the country, and is the founder of Behavioral Solutions, a therapy practice here in Lexington, MA. WSL’s mission statement highlights not only the school’s arts-integrated academic education—rich in the humanities, sciences, and practical and fine arts—but also critical thinking, collaboration, and engagement with the world. 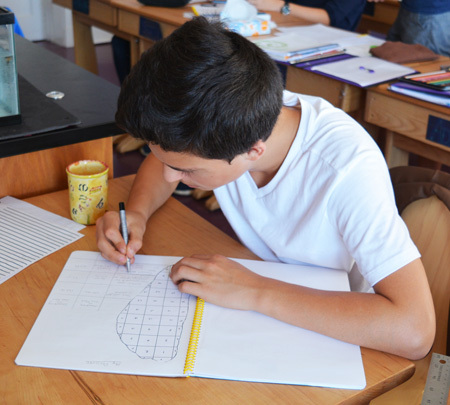 WSL’s curriculum teaches students about cultures from many countries and civilizations, both ancient and contemporary, encouraging an openness to others and respect for difference. 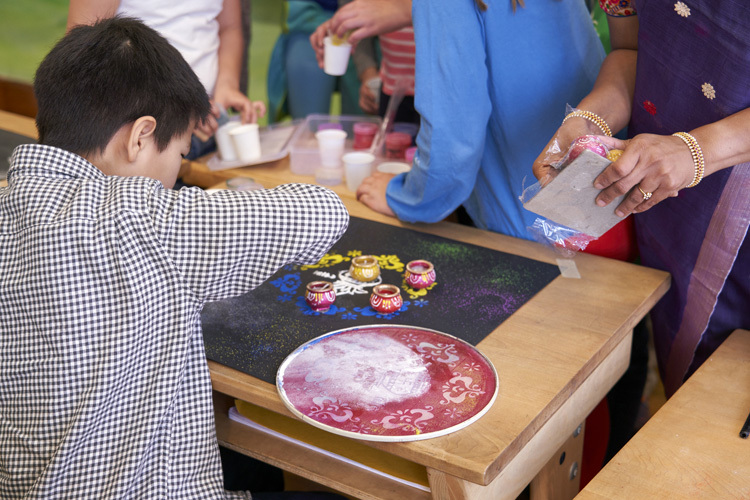 By approaching learning through first-hand observations, Waldorf teachers encourage students to see, learn, and think for themselves, forming their own conclusions rather than accepting another’s point of view without question. These aspects of the curriculum and pedagogy are just some of the many ways that Waldorf education prepares students to enter the world with eyes, minds, and hearts open, seeking beauty and truth, ready to shine their lights brightly into the culture of our time. At WSL, teachers delight in their students, teach them, listen to them, mentor them, and love them. “Waldorf offered me diverse, creative, exciting ways to learn and engage with the world. At WSL, teachers have a personal connection with each student. They understand each child's strengths, weaknesses, passions, and challenges. 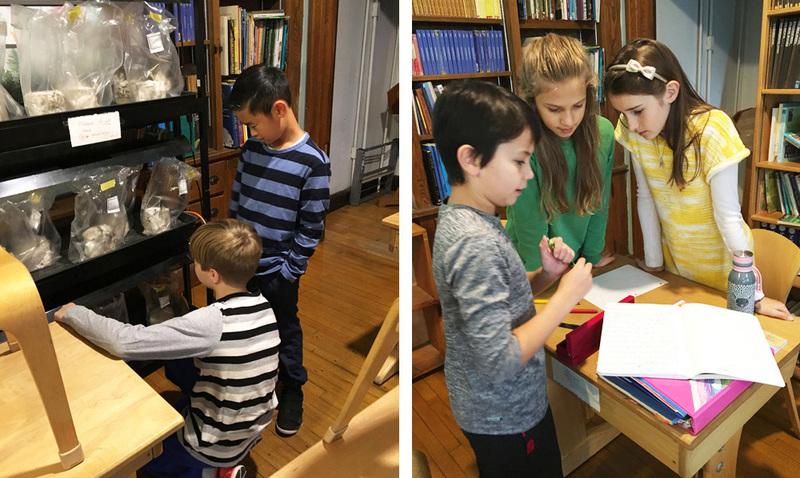 Recording first-hand observations is the cornerstone of many Waldorf science lessons. 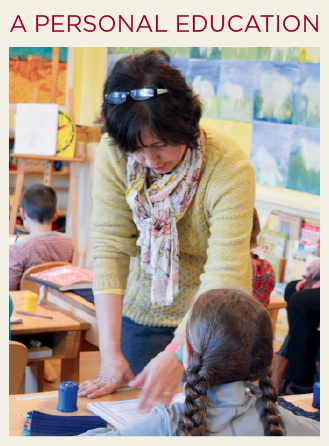 One of the benefits of Waldorf education is that the curriculum allows students to learn through hands-on experiences, forming their own ideas and conclusions through personal observations. WSL’s 4th grade farm trip, part of the Human Being & Animal block, is one of these opportunities. There is a huge difference, for example, between reading about cows not having an upper row of incisors and actually putting your hand into the mouth of a 10-day-old calf and feeling it suckle your hand with its soft gums and rough tongue. After a 3-hour bus ride, we arrived at Hawthorne Valley Farm in Ghent, NY. The class was divided into three groups and set out on a daily regimen of chores that ranged from cooking and serving meals, to feeding animals and cleaning out stalls, to hauling firewood. They observed and compared the gaits of different animals and even tried to walk and trot like a horse—which proved a lot harder than it may seem. They learned about the cow’s four stomachs and compared them to the chicken’s gizzard. They compared the pig’s poor vision to the keen eyesight of the chicken. Everyone was quite amazed that pigs have a very fine nose (helping to compensate for their poor eyesight) and can detect tasty morsels far below ground. Next time you're on a working farm, put on your mud boots, catch a sow or a piglet, and see if you can do pig math! After sketching a litter of piglets, students were asked to catch a piglet and do “pig math” by measuring its girth and length. Since the piglets proved rather nimble and quick, the head counselor, Andrew, entered the pen of adult sows and measured one for us. Then multiply the product by the length of the pig. Now divide that product by 400 to establish the approximate weight of the animal in pounds. Students calculated that the sow weighed as much as 5 or 6 fourth graders! Students learned methods of putting up surplus harvest for the winter. Despite cold weather, there were still plenty of vegetables to be harvested. Since a farm’s bounty is always more than people can eat at one time, the children learned to preserve food by pressing apple cider, cooking apple sauce, and drying apples into fruit leather. The farm trip also has a huge social learning component. The children learned to live and work together day and night, away from their families. Table manners, social skills, an ability to advocate for oneself, and keeping track of one’s belongings all are skills that we practiced. Students enjoyed taking turns pressing apple cider. There are many challenges, of course, such as unfamiliar foods, creaky bunk beds, homesickness, and actual illness—all of which we experienced. But the class rallied around those who were having trouble, and the counselors praised the children for their teamwork, kindness, and willingness to be mindful of each other’s needs. It was a pleasure to spend another week at Hawthorne Valley Farm. We reconnected with old friends and made new ones. 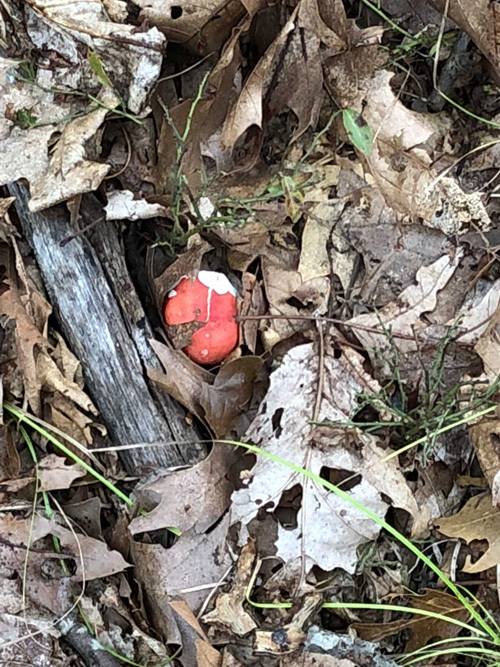 The class is looking forward to our next farm adventure in 5th grade when we’ll study mushrooms and plants as part of our botany block. In fourth grade, the Waldorf school curriculum calls for an orientation of the child in time and space. The topics of local history and geography are ideally suited for this goal. Our hike introduced the class to these topics physically by walking through the landscape and retracing some of the historical tracks left behind by glaciers and people who lived here before us. WSL is fortunate to be located adjacent to Arlington's Great Meadows, 183 acres of conservation land that protect wildlife and provide local flood control. It was a beautiful, sunny October morning, with fog rising from the Arlington Great Meadows and dew sparkling on tall reeds, Jerusalem Artichokes, and Stag horn sumac leaves, when we set out to hike from the Waldorf School to Whipple Hill with four parent chaperones. Whipple Hill is the highest point in Lexington and rises to 375’ of elevation. The class walked through Gnome Valley and past Boomerang Hill and discovered that these magical places are actual glacial knolls, left behind by the Laurentide Glacier some 15,000 years ago. 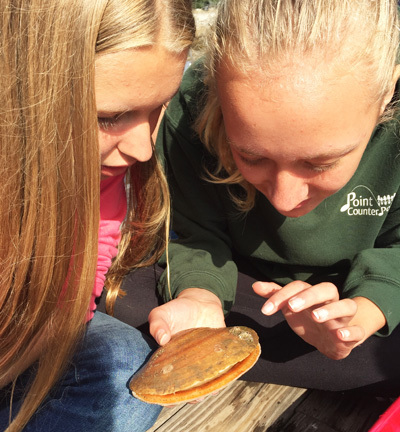 Students heard about the history of Arlington Great Meadows, which in the past was a dairy farm, a lake that provided drinking water for Arlington, and now conservation land that provides habitat for migratory birds and other animals. The children hiked along the carriage paths left behind by farmers and peat cutters and marveled at the huge, albeit currently dry, vernal pond near Lexington Christian Academy. While walking along the paths the children noticed not only some very old trees (that must have been already in existence when the area had been a farm), but also thrown rock walls, and steep and craggy rocky walls on both sides of our path. The summit of Whipple Hill is mostly bare, solid rock. The students noticed that this dark rocky surface had many scrapes (striations) that all went into one direction. After checking with a compass, we confirmed that the direction of these gouges ran north to south and that we were sitting on and looking at glacial scratches, created when the Laurentide glacier moved over this very old igneous, volcanic bedrock called gabbro thousands of years ago. We also discovered a pink granite bolder that had been left behind by that same glacier. This rock is a so-called erratic, a rock that must have come from somewhere else, because there is no pink granite in this area. After a quick stop at Locke Pond, the students finally climbed Whipple Hill from the east and happily settled down for a well-deserved snack once they reached the “summit”. Students observed striations created by the Laurentide glacier as it receded. It's hard to spot, but on the left there is a chunk of pink granite, a so-called "erratic" that was deposited by the glacier. The view was gorgeous and the warm stones invited us to linger, but we had to walk back home and merrily finished our 5-mile round trip into history and geography in time to be back in school for orchestra class. Welcome back! 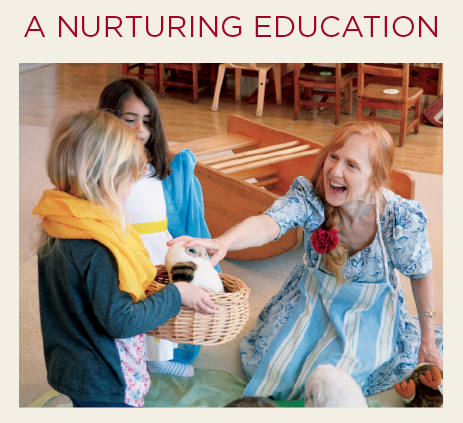 Whether you are new to the Waldorf School this year or returning, we are very excited to have you and your children as a part of our school community. We began the school year with a special tradition—the annual School Warming—an evening of welcoming, camaraderie, and singing led by WSL’s new Chorus Teacher, Tudor Bota. There is nothing like inaugurating the new school year in four-part harmony! As I listened to Jeanette Voss, fourth grade Class Teacher and Chair of the College of Teachers, characterize the values of Waldorf education, I was once again reminded of the impressive skill, energy, and dedication that our faculty contribute every day to challenge and stimulate our students in creative ways. Woodworking teacher Andy Freeburg carefully stripped this sign down to bare wood and, one by one, applied twelve new coats of varnish. Thank you, Andy! Over the summer our classrooms, facilities, and campus were renovated and renewed so that our school can once shine brightly with the promise of new beginnings, new friends, and new experiences. It is a great privilege for us to care for and educate your children. 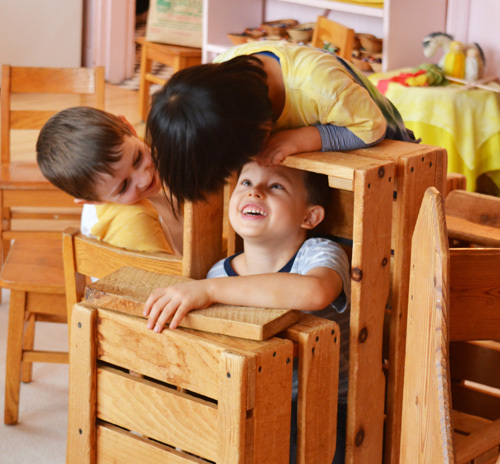 Thank you for being a part of our Waldorf School community! In the words of Howard Gardner, we are striving for “beauty, truth, and goodness” in our work here together at WSL, and we invite you all to come along on this journey. WSL’s experiential approach to learning was on display when third graders visited Meadow Mist, a family farm in Lexington. 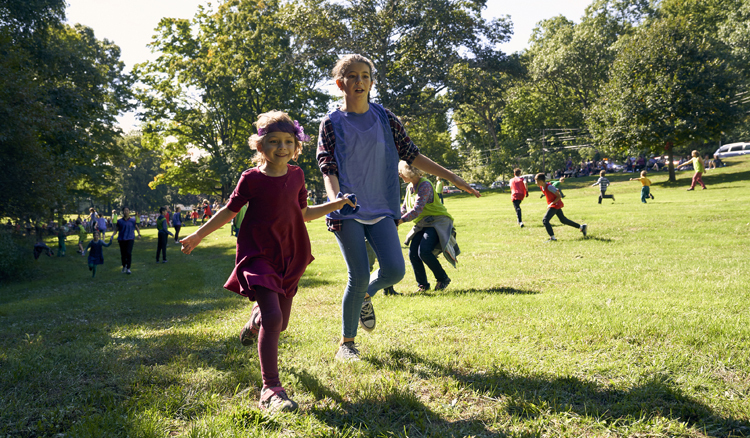 This fall, third grade students at the Waldorf School of Lexington skipped the school bus and walked a mile and a half each way to a local farm. After visiting chickens and cows and petting the lambs, students split into groups and got to work. One group harvested two rows of carrots with pitchforks, while the other shoveled manure to muck out a stall in the barn. Still full of energy, the kids set to work on the strawberry patch, pulling up two wheelbarrows full of weeds and hauling them to the compost pile. Farming is one of the central themes of the Waldorf third grade curriculum. Throughout the year, teacher Jeanette Voss will take her third graders on several field trips to working farms, allowing them to experience the rhythm of agricultural and seasonal cycles. 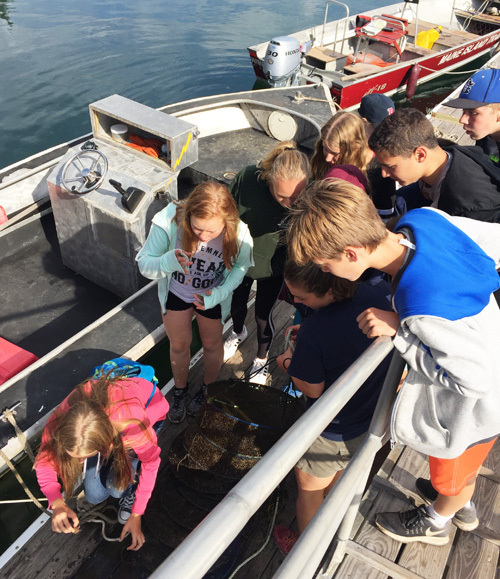 The excursions also involve students in volunteering and place-based education. At WSL, all third graders take their first week-long trip to Hawthorne Valley Farm, a 700-acre biodynamic farm whose mission, in part, is "to connect children and adults with the land and the food that nourishes them." 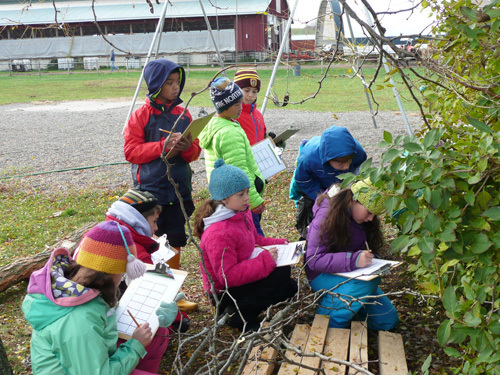 By learning about food sources, the cycles of planting and harvesting, and the tangible sensations of earth itself, third graders at the Waldorf School of Lexington deepen their understanding of the world they inhabit. 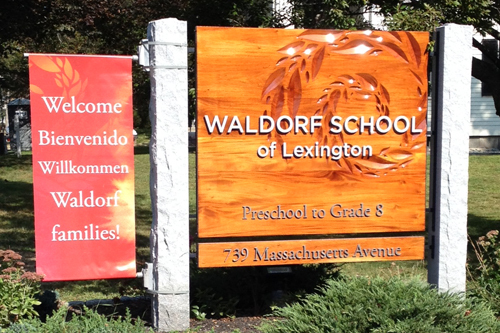 Learn more about the Waldorf School of Lexington curriculum for grades 1–8. What's Really Good for Kids? Erika Christakis will be speaking at the Waldorf School of Lexington on Thursday, October 20. As controversy and debate continue over the Common Core, parents can understandably find themselves torn about what is best for their children. While many decry tough state and federal standards, learning to read at the age of five can easily seem like an important advantage—especially in a system where academics now often begin in preschool. In The Importance of Being Little: What Preschoolers Really Need from Grownups, lecturer and researcher Erika Christakis of Yale University tells us that young children do not need high-pressure instruction. Nor do they need insipid craft projects or classroom walls jammed with vocabulary lists, job charts, ready-made posters, and seasonal kitsch. Really? College and career prep for five-year-olds? As Christakis emphasizes, children are born to play, connect, and learn. We just need to let them. 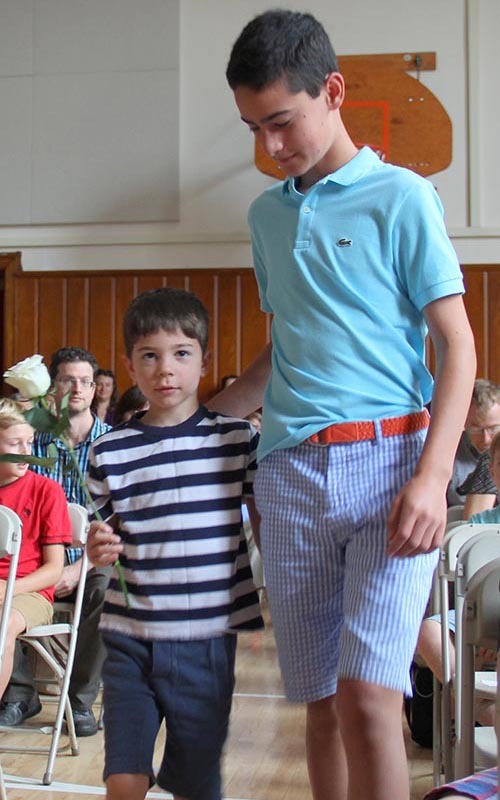 Elementary and middle school students at the Waldorf School of Lexington started the school year with one of Waldorf education’s most heart-warming traditions…the Rose Ceremony. 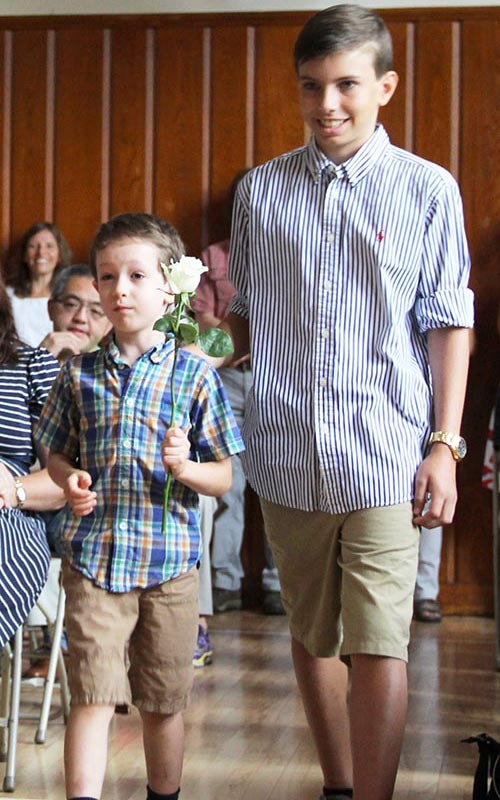 Eighth graders, entering the last year of their Waldorf journey, welcomed incoming first graders to the beginning of their journey with the gift of a rose. Like most Waldorf celebrations, the event was filled with music. The sweet notes of a harp welcomed students, parents, faculty, and staff. And everyone joined in singing favorite school songs. 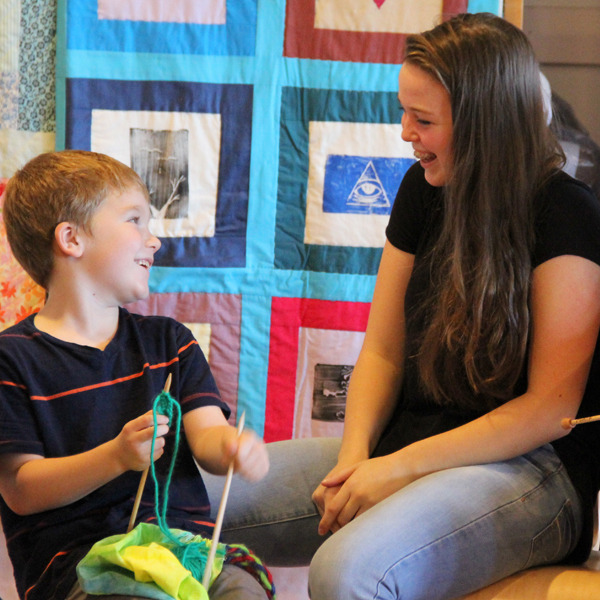 As tall teenagers stooped over timid six- and seven-year-olds, offering an encouraging smile and a guiding hand, the strong relational quality of Waldorf education was evident. At WSL, students learn in connection with others. Strong bonds are formed with the class teacher, subject teachers, and peers—with whom students collaborate, discuss, disagree, and resolve conflicts. After the ceremony, first and eighth graders gathered outside, beginning a friendship that will grow throughout the year. 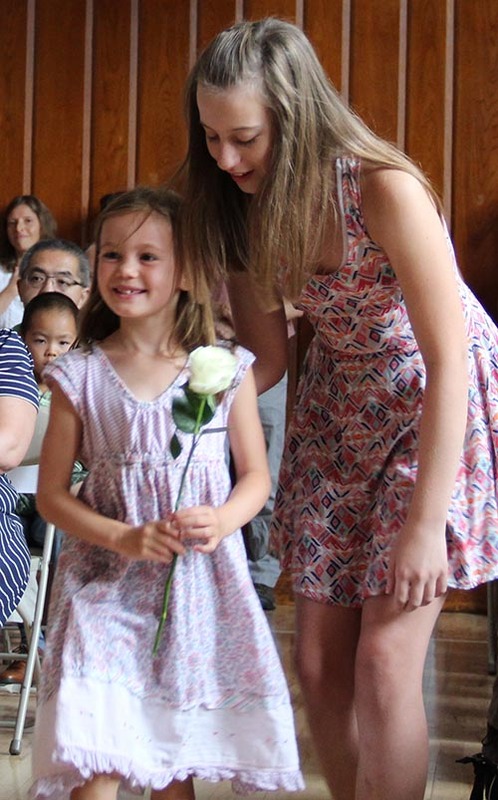 In June, we complete the circle with another Rose Ceremony, as the first graders bid goodbye to their eighth grade buddies and send them off to high school with a rose. We are all on a journey of one kind or another, and our bonds with each other are what support us along the way. The rose, passed from old to young and back again, symbolizes the strength of those relationships and the vital role they play in Waldorf education. We would like to offer a warm welcome to four new faculty and staff members as well as acknowledge two important staff transitions. At WSL, we are very fortunate to attract and retain highly qualified faculty and staff who—together with parents, alumni and alumni parents, grandparents, friends, and of course students—help create the warm and welcoming community that we value so highly. A former student at WSL, Ms. Calabro earned a B.M. in Cello Performance from The Boston Conservatory. She was a fellowship recipient at the Texas Music Festival and the Marrowstone Music Festival and performs with orchestras including the Eastern Connecticut Symphony, the New England Symphony, and the Cape Ann Symphony. She also performs at weddings and social functions with an electro-pop group. Ms. Calabro has taught at summer programs at Longy Preparatory School and Indian Hill Music School. A recipient of the Mendenhall Scholarship Award at WSL, Ms. Calabro began her cello studies with Jane Sheena. Ms. Clements received a B.A. in English from Emmanuel College, earned her M.Ed. from UMass Boston, and is certified in English Language Arts for grades 5–12. A voracious reader and passionate writer, Ms. Clements has designed and taught core curriculum units in literacy and created writing workshops in schools across diverse populations. Her student project, “Going For Broke,” was selected and displayed by the late Tom Menino in the Mayor’s Gallery in 2013. Ms. Clements hosts writing workshops for teens and also coaches novice teachers and facilitates symposiums on the joys of teaching and learning for the Boston Teacher Residency Program. Ms. Clements is the mother of two adult sons and one grandson. Ms. Haley earned a B.A. in English and an M.A. in Shakespeare from the University of Bristol in England, as well as an M.S. in Journalism from Columbia University. She works as a freelance writer and is the founder and director of Lola Children’s Fund, a nonprofit organization that supports HIV-affected children and families in Ethiopia. 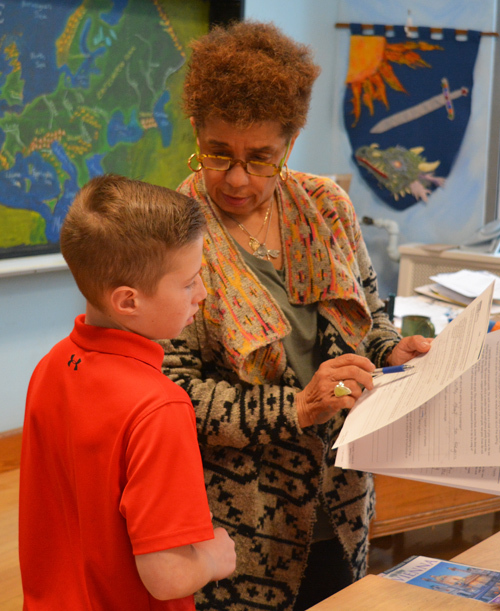 Ms. Haley also serves as secretary of the board for Friends of Haggerty, a program that raises funds for enrichment activities at her daughter’s Cambridge public school. After earning a B.S. in sociology from Kenyon College, Ms. Yon moved to Chiang Mai, Thailand, where she taught English for five years. She then completed a Waldorf Teacher Certification program at Taruna College in New Zealand and earned an M.Ed. from Cambridge College in Cambridge, MA. During this time Ms. Yon worked at WSL as a teaching assistant in first grade. Most recently Ms. Yon taught at the Waldkindergarten program at Natick Community Farm. Ms. Yon will be teaching WSL's incoming class of first graders. We are pleased to announce that Kate Woll has been hired as WSL’s Admissions Director, having filled this role for the past year on an interim basis. Ms. Woll received a B.A. in International Affairs from George Washington University with a concentration in Intercultural Understanding and a minor in Spanish. She also earned an M.Ed. from Antioch University. Ms. Woll worked for a number of years as a Women’s Rowing Coaching Assistant at Harvard University. More recently she served as the Operations Assistant for the university’s rowing program and also worked for the Institute for Rowing Leadership in Boston, supporting IRL fellows in their coaching education. Ms. Woll’s husband, Chris Woll, is a member of WSL’s Board of Trustees, and their daughter Carly is a student at WSL. We are very sorry to announce the departure of Paula Antonevich later this fall. Paula joined the team at WSL in October of 2013 and immediately took hold of the school’s development plan and began building relationships with her signature warmth, unassuming manner, and sense of humor. She also put her experience in development, marketing, and event planning to work building WSL’s development office from modest beginnings to what today is a thriving and essential element of the school. Along the way Paula has strengthened and advanced core development events at WSL, including Annual Giving, the Mendenhall Benefit Concert, Grandparents Morning, and the school's Spring Party & Auction. This spring, she launched WSL's major, five-year endowment challenge, spearheaded by the generous Hartt-Wiedie gift to the school’s Endowment Fund. As Paula moves on to her next challenge, we offer our sincere thanks for her significant contributions at WSL and wish her the very best.